What does the Social Group provide? Members can socialise with their friends and make new ones in a peaceful and relaxing atmosphere. Members are able to give help, support and encouragement to each other. It enables members to improve their self confidence and self worth. A variety of activities are provided; pool, darts, word and board games and Art and Craft sessions on the 3rd and 4th Thursday of the month. Access can be available to CAB regarding welfare benefits. New members are always welcome and can just turn up on the day. Tuesday and Thursday, 10.30am – 1.30pm. Reigate Stepping Stones is based at Redhill Football (Social) Club, which is easily accessible by public transport and by car. Bus – Take any bus to East Surrey Hospital and get off at the first bus stop on Three Arch Rd. Walk along the grass verge and turn into the Redhill Football Club car park. The Social Club is located at the end of the car park. 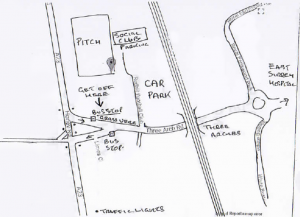 Car – There are parking places outside the Redhill Football (Social) Club at the back of the car park.